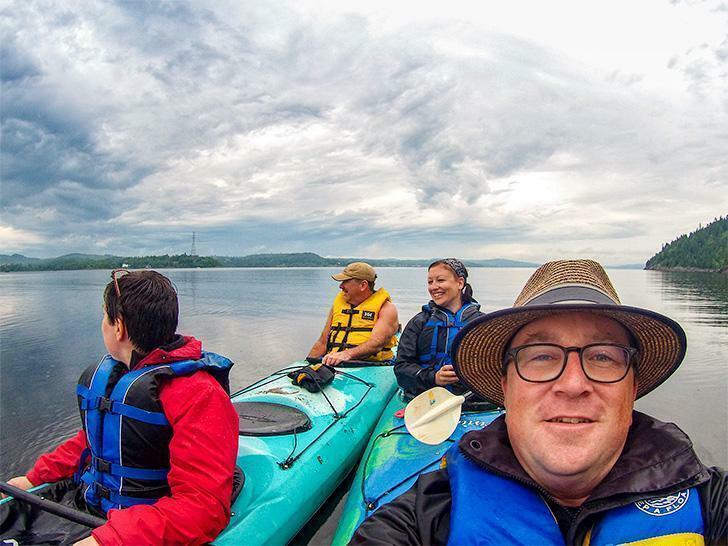 We take a kayak tour of Dominion Park, part of the Stonehammer Geopark in Saint John, New Brunswick, to see stromatolites, with Go Fundy Events. As the loons crooned their eerie songs through the fog over the motionless river, every reservation I had about my first kayaking excursion vanished. There had been plenty. But, at that moment, it felt like I was one of only four humans on earth rather than in the heart of a crowded city. I had wanted to try my hand at kayaking for years. I love being on the water on boats of all kinds. Sails, outboards, paddles, it doesn’t matter the method of propulsion. Hell, I even get a little thrill from taking a ferry. But one of the few boating experiences I had never had was kayaking. 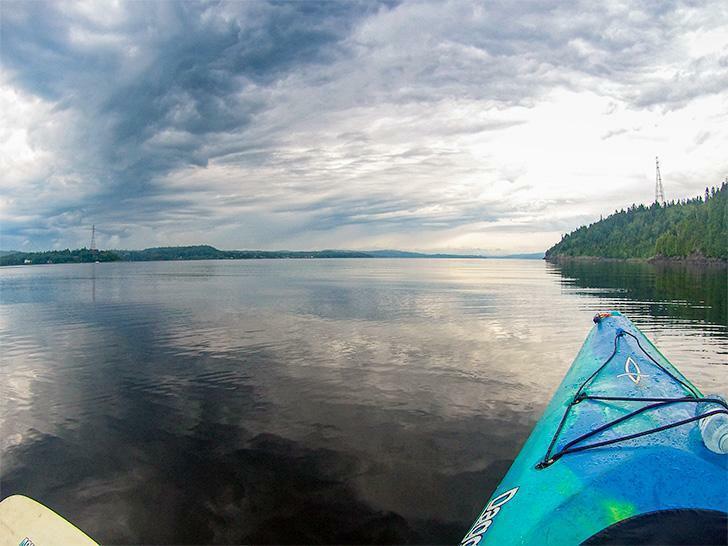 So, when I was asked if we’d like to try our hand at kayaking with Go Fundy Events in Saint John, I was already onboard. When I learned we’d get to see ancient fossils only accessible by water, AND we’d be reuniting with two of our favourite Canadian travel bloggers for the trip I was even more excited. Then the reservations set in. 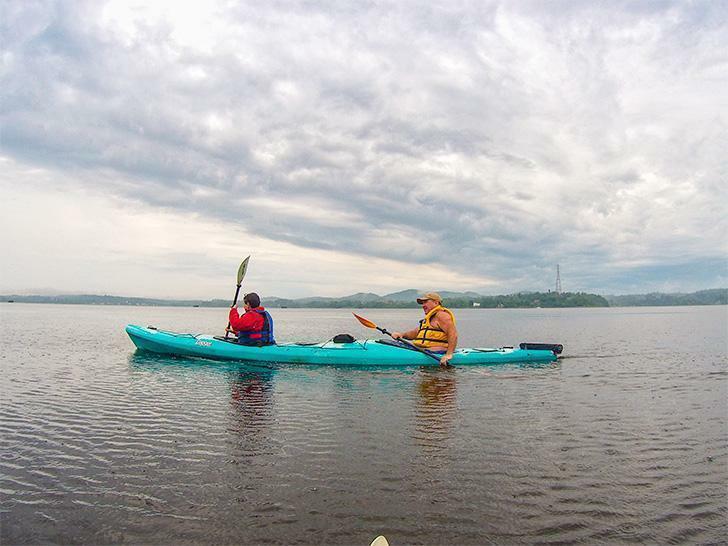 Pete and Dalene, our friends from Hecktic Travels, had kayaked all over the world, including a multi-day trip around Greenland. With my lack of balance and puny upper-body strength, how on earth was I going to keep up with them? Things didn’t look any brighter the morning of our trip – literally. Saint John isn’t known for its fantastic weather. 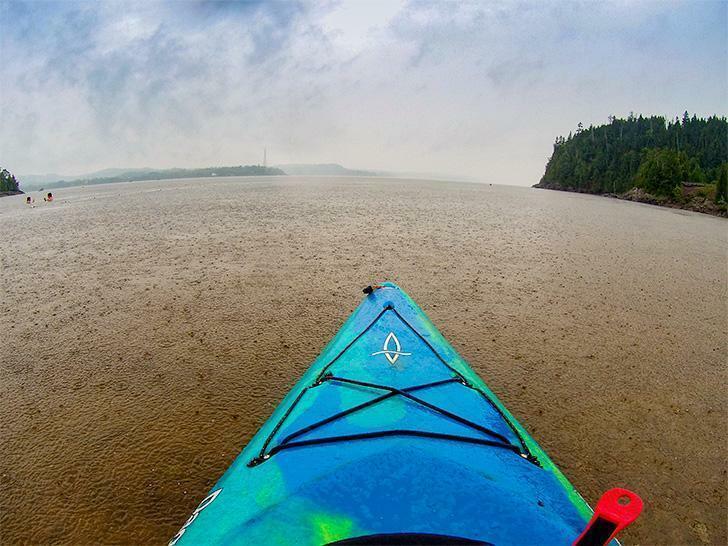 Our beautiful Bay of Fundy comes with a downside – fog, and lots of it. Along with the fog, that morning came a healthy dose of rain. We had no contact information for the tour organiser, our tourism contact was out of town for the weekend, and we didn’t know how to get in touch with the Hecks. There was nothing for it but to head to the rendezvous point. We were the first to arrive at the Dominion Park parking lot. The location brought back a flood of childhood memories. Dominion Park has the only supervised public beach on the St. John River within city limits. The majority of beaches in and around Saint John are on the bay. While the Bay of Fundy is beautiful, it’s not warm. There are only about six days a year when the heartiest of souls brave the water for more than a few minutes. So Dominion Park is a popular bathing spot for Saint John families. When I was in Junior High School, before I had access to the freedom of the family car, my best friend and I often rode our bikes to Dominion Park. I spent many a summer afternoon bumming around the beach and playground, trying to feel older than I was. I was immersed in memories when the Hecks pulled up wondering what our thoughts were on the weather. Figuring we had come this far, if the trip was still on then we were up for it. Dalene was game to join us, while Pete opted to catch up on work. Decisions made, our guide arrived, and we set about preparing for our first kayak trip. As Andrew and I were newbies, we split up. Andrew joined Dalene, and I climbed in the kayak with our guide. 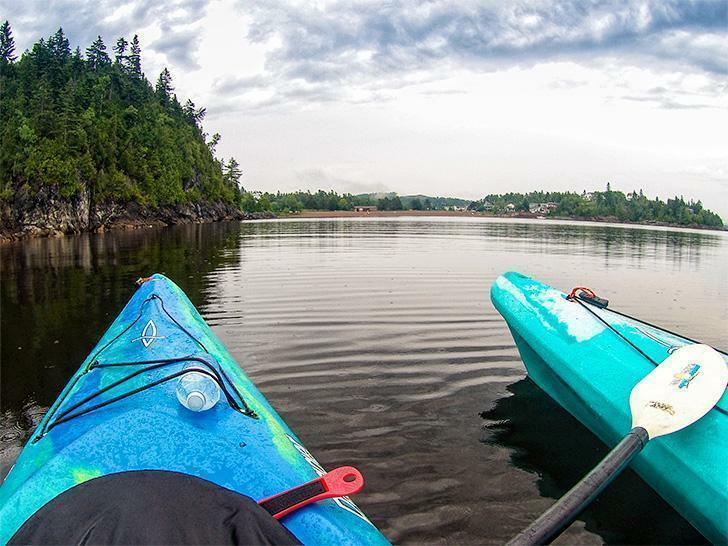 One question remained; with the spectacular Fundy coast at our doorstep, why were we kayaking at the relatively unknown (outside of Saint John, anyway) Dominion Park? The answer is billions of years old. 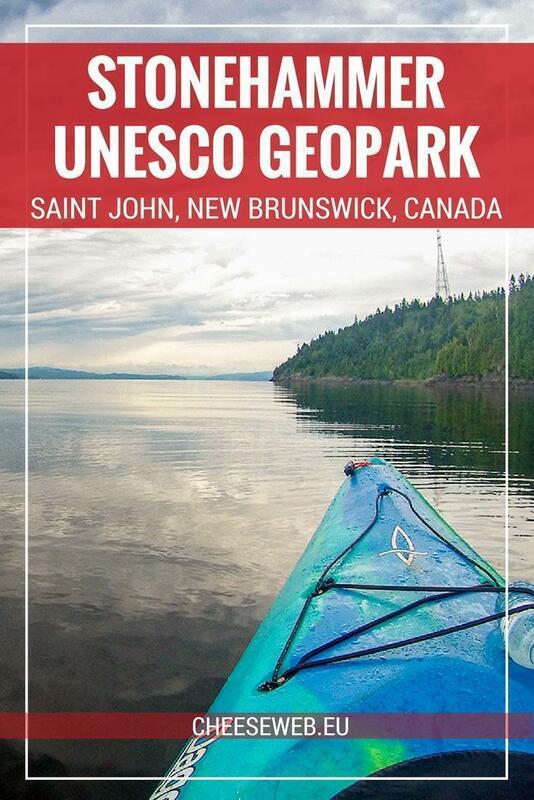 Dominion Park is one of more than a dozen sites around Saint John and southern New Brunswick that make up Stonehammer Geopark, the first North American member of the UNESCO Global Geopark network. We’ll have an in-depth article on Stonehammer coming soon, but essentially the area has been recognised for its wealth of fossil records of almost every period of the earth’s evolution. We were at Dominion Park to witness the first documented fossils from the Precambrian era, called stromatolites. 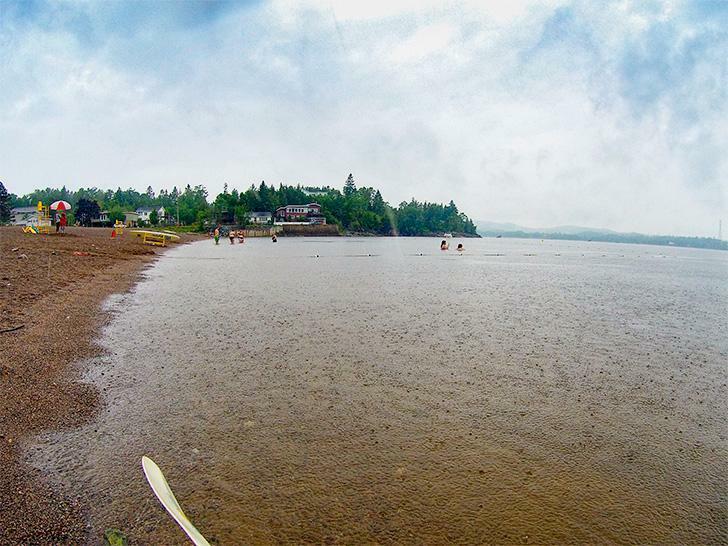 As the rain continued to come down, we pushed off from the shore and dipped our paddles into the water. We glided silently through the water towards Green Head Cove. 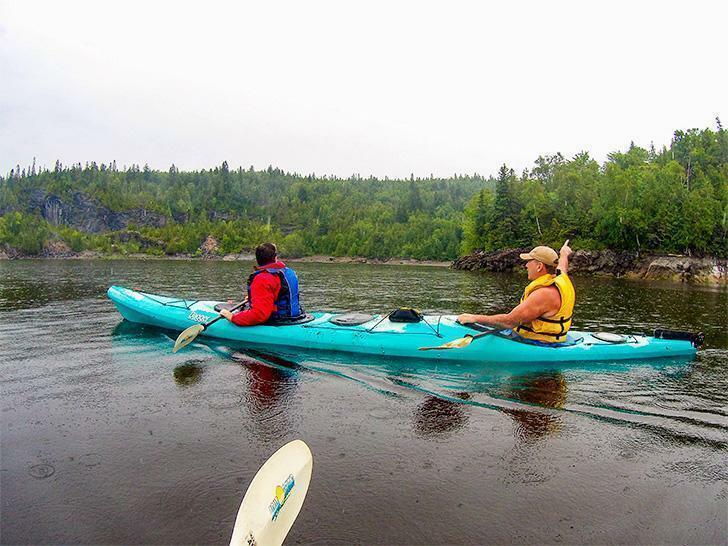 It wasn’t long before we pulled our kayaks up beside a stone outcrop. There, above our heads, was a series of whirls and concentric rings in the rock. We had found our stromatolites. Geologist George Matthew first wrote about stromatolites, near Dominion Park, in 1890. 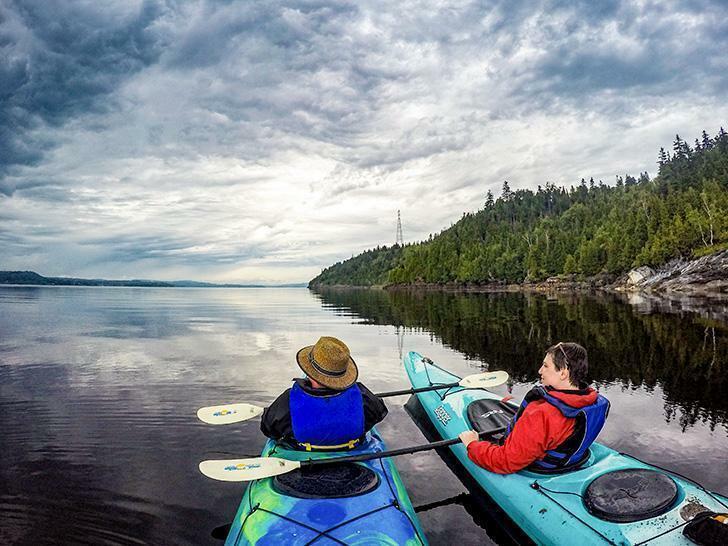 Matthew’s stromatolite is on display at the New Brunswick Museum in Saint John, but we could see plenty of others from our kayaks. After our visit with the stromatolites, we rounded the cover to see the Swift Point lighthouse. 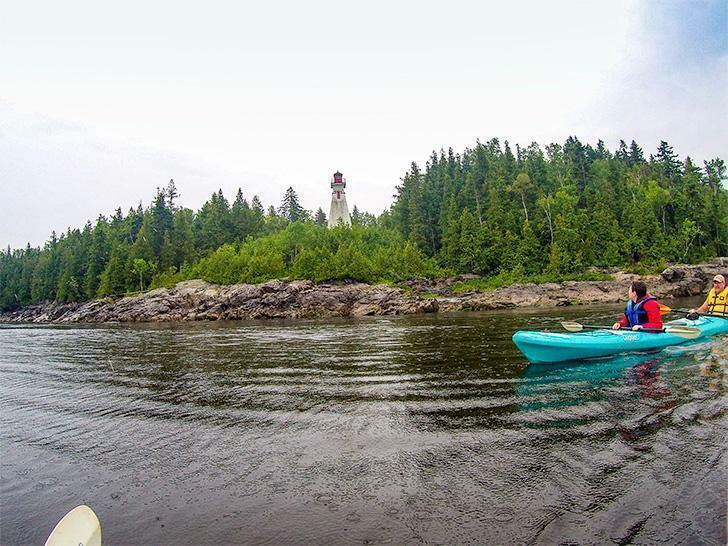 This was one of six lighthouses, that served as beacons on the St. John River all the way to Fredericton. The Swift Point light helps guide boats into the channel leading to the Reversing Falls and out into the Bay of Fundy. As we turned to head back to the beach, the rain had finally let up. A light mist was rising from the River, which had completely stilled. Although we were in the heart of the city, out here on the water, everything was silent. We stopped to enjoy the stillness and beauty of this mighty river. That’s when we heard the loons. They seemed to be reminding us that urban Saint John was a mere blip in the history of this area; a history billions of years old. 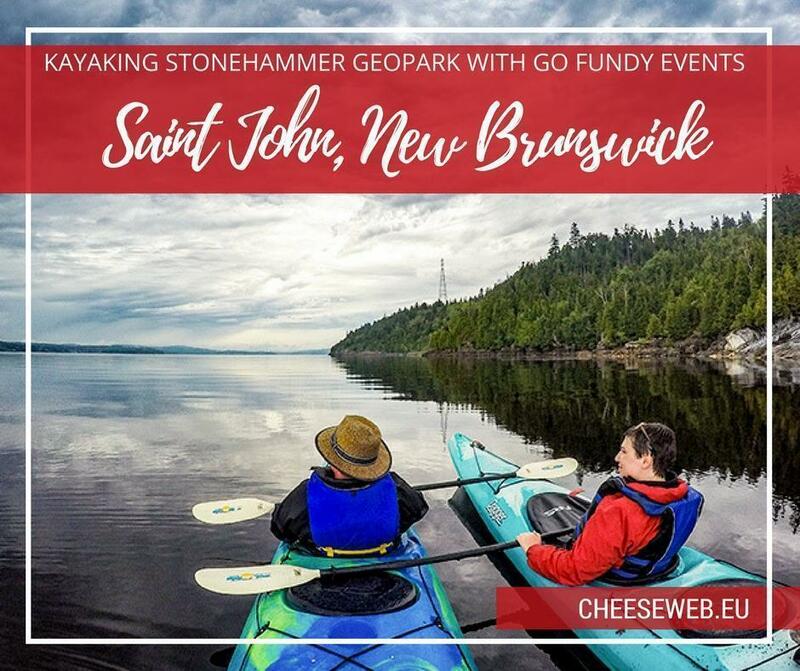 Details: A kayak trip with Go Fundy Events is a unique way to experience the Stonehammer GeoPark in Saint John. 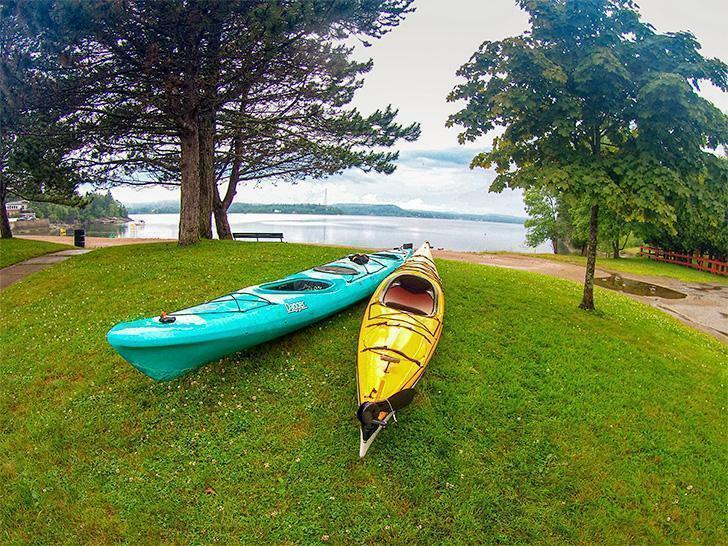 It’s a perfect introduction to kayaking for beginners and is open to groups and individuals alike. 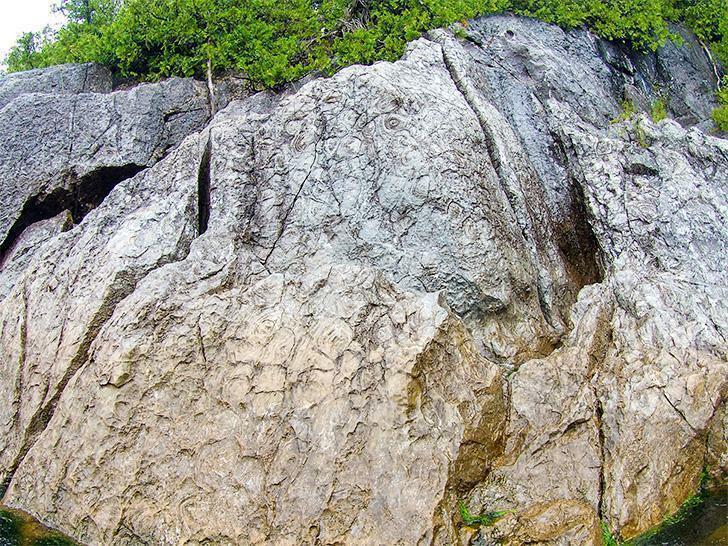 The guides are professional and knowledgeable about Dominion Park and the Stonehammer Geopark. Contact Go Fundy Events for details. 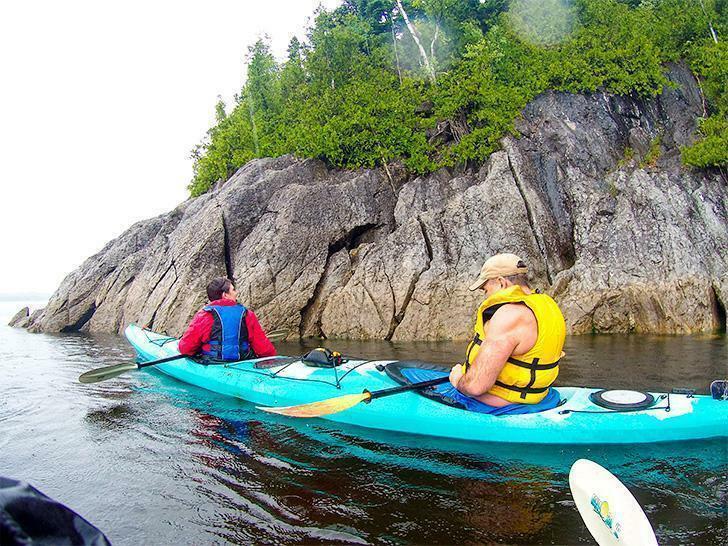 We’d like to thank Go Fundy Events, New Brunswick Tourism, and Discover Saint John for inviting us to discover the Stonehammer Geopark by kayak. As always, all opinions remain ours alone.